For a disease to strike, certain environmental and soil conditions must align. The challenge, as you well know, is preparing for the unknown months in advance. The good news is knowing your risks for soybean cyst nematode (SCN) and sudden death syndrome (SDS), for example, can help determine your plan of attack. 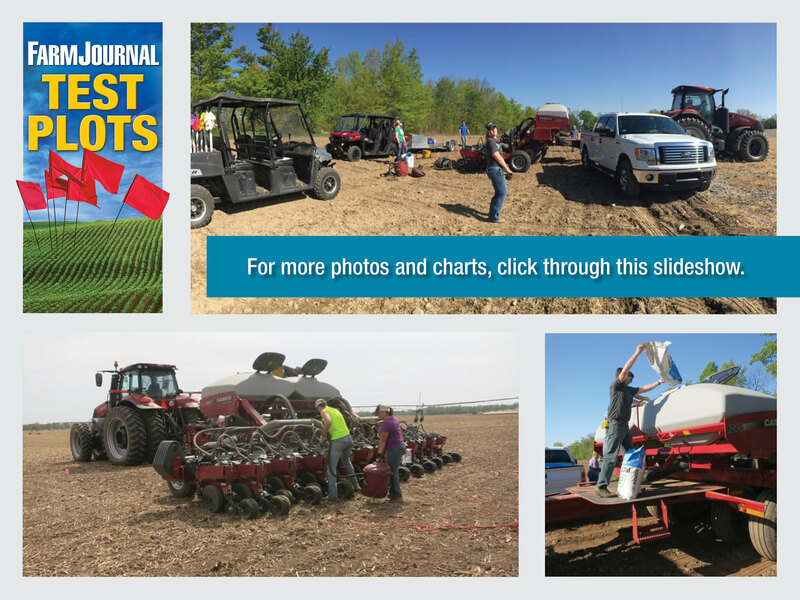 Farm Journal Field Agronomists Ken Ferrie and Missy Bauer, as part of the Farm Journal Test Plots program, have been studying how genetics and various seed and foliar treatments fit into a soybean disease management strategy. In the first of a two-year effort, Bauer set up field tests to determine if yield and return on investment can benefit by selecting soybean varieties with SCN resistance and seed treatments. “Today we have more tools in the toolbox; we just need to determine the best ones for our farms,” Bauer says. In south-central Michigan, field trials were conducted in three locations using two varieties (2.8 relative maturity) with genetic resistance for SCN: PI88788 has resistance to SCN races 14 and 3 and Peking has resistance to SCN races 1, 14, 3 and 5. Three seed treatment systems were evaluated on each variety as well: Bayer’s ILeVO plus fungicide and insecticide, fungicide and insecticide only and no treatment. Overall, the fields had low SCN pressure and no visual SDS symptoms. “Since the Peking genetics have a stronger line of resistance it might be providing a lower response to the ILeVO seed treatment,” Bauer says. When averaging the two varieties together, the best treatment was still the ILeVO plus fungicide and insecticide with a yield increase of 3.68 bu. per acre versus the non-treated check and a net return of $11.10 per acre. In terms of SCN management, using the Peking genetic resistance and/or ILeVO did reduce SCN numbers based on soil samples at harvest. Stand counts improved with the fungicide and insecticide seed treatment. Even with relatively low SCN pressure and no visual SDS symptoms, ILeVO paired with a fungicide and insecticide seed treatment are good tools to improve yields in PI88788 genetics, Bauer says. “This plot effort was also a good reminder of the importance of fungicide and insecticide seed treatments to increasing yields with good return on investment,” she adds. In 2017, Bauer also gathered a third year of results on side-by-side trials comparing ILeVO plus fungicide and insecticide and a fungicide and insecticide only. Across multiple locations in 2015, 2016 and 2017, the ILeVO plots averaged a 3-bu.-per-acre increase. The benefit was most prominent in 2016 at 4.2 bu. per acre. In terms of economics, using ILeVO resulted in a $14.72-per-acre net return averaged for all three seasons compared with a fungicide and insecticide only. In 2016, ILeVO resulted in a $27.50-per-acre net increase. In Illinois, the benefits of ILeVO varied based on planting date, field conditions and the weather. Based on planting date, the test plots in Illinois saw some yield bump using ILeVO in earlier soybeans in conventional-till conditions, but the benefit dwindled and was even negative the further into the planting window, Ferrie explains. The response lasted longer in no-till. The biggest response to ILeVO in the same field in 2016 was a 19-bu. difference between treated and untreated strips. The average across all test plots was 5 bu. per acre. In 2017, the ILeVO plots in Illinois didn’t result in a yield advantage. As Bauer saw in Michigan, using ILeVO can push back maturity. “We could see that the soybeans stayed green longer, but that didn’t work in favor of yields at harvest, likely because August turned dry,” Ferrie says.